8 slices of the classic bacon and Gruyère cheese quiche made in a buttery shortcrust pastry case. Cows' Milk, Pasteurised Free Range Egg, Wheat Flour, Butter (Cows' Milk) (10%), Ham (7%) (Pork, Salt, Water, Sugar, Stabiliser: Triphosphates; Antioxidant: Sodium Ascorbate; Preservative: Sodium Nitrite), Onion (6%), Cheddar Cheese (Cows' Milk) (5%), Bacon (4.5%) (Pork, Salt, Sodium Ascorbate, Sodium Nitrite), Gruyère Cheese (Cows' Milk) (1.3%), Cornflour, Medium Fat Hard Cheese (Cows' Milk), Parsley, Rapeseed Oil, Salt, Pectin, Cayenne Pepper, Mustard Powder, Black Pepper. 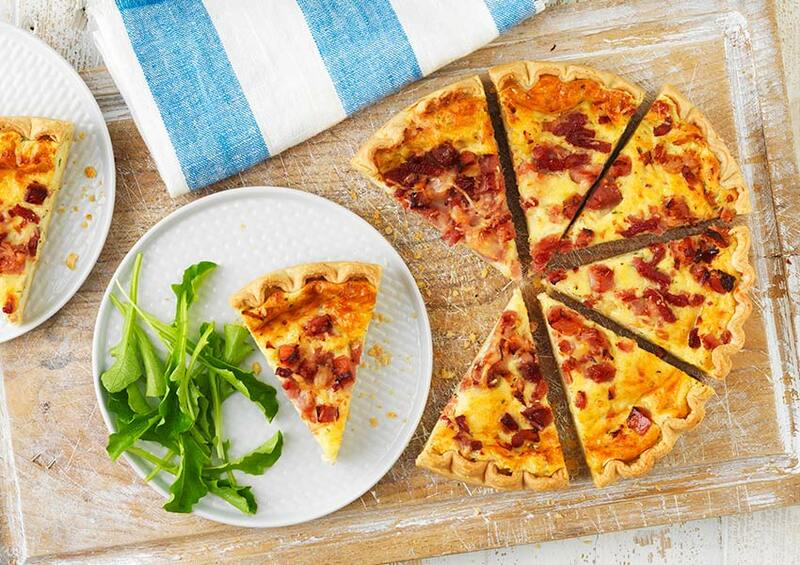 A ham, cheddar and onion filling in an all butter short crust pastry case, topped with bacon and Gruyère cheese.